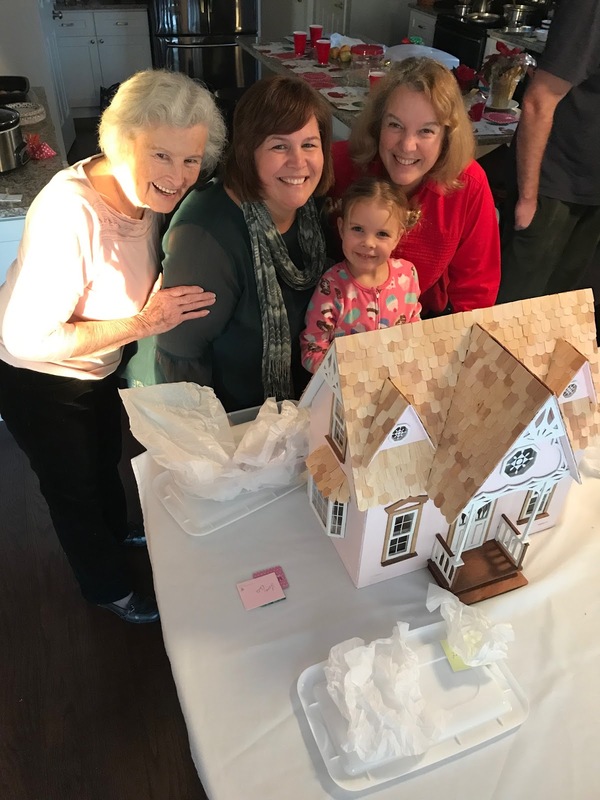 When I was a little girl, my grandfather built each of his seven granddaughters a dollhouse. It was a beautiful tri-level design. It was also seven feet long. Huge. I played with my house for hours at a time. My grandmother helped me make furnishings for it and I bought things for it with money I earned selling potholders I made. I have happy memories of that dollhouse. Now I am a grandmother. I have three granddaughters of my own. A couple of years ago I decided I would build each of them a dollhouse. After Christmas in 2016 I purchased three dollhouse kits. The plan was to put together the houses over the course of the following year. I figured it to be a cinch. I had a year to complete three houses. Grandpa had less time to build seven of them. And he had to draw out the plans and cut the wood. I was smart. All I had to do was punch out the “precut” pieces and use the “easy to assemble” directions. Hammer and finish nails? Not necessary. All my kit called for was a hot glue gun. It came with everything else. Unless of course I wanted to paint the house… or sand the pieces first. A ruler would be handy. Luckily I had a utility knife. And wood putty. As it turned out, I didn’t even start the dollhouse project in 2017. I moved into a new house first and then halfway around the world until the middle of June in 2018. But I was determined to build those houses for my sweet girls for Christmas 2018. The first unfinished house...sans shingles. The first thing I learned is that ”precut” is a relative term. Sometimes the “cutter” had merely made an impression on the wood that I then had to carefully cut out with my utility knife. Then there was the issue of the missing pieces. I had to make those. Fortunately, I had two other kits to look at to use as patterns. All of the kits had missing pieces but luckily not the same pieces. Easy to assemble, detailed directions, and online support are terms loosely thrown about by the manufacturer. The directions may be detailed but that doesn’t mean they are easy to understand. 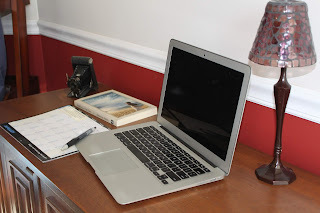 But this blog isn’t aimed at grumbling, so please forgive me if I sound as if I’m complaining. I’m not. 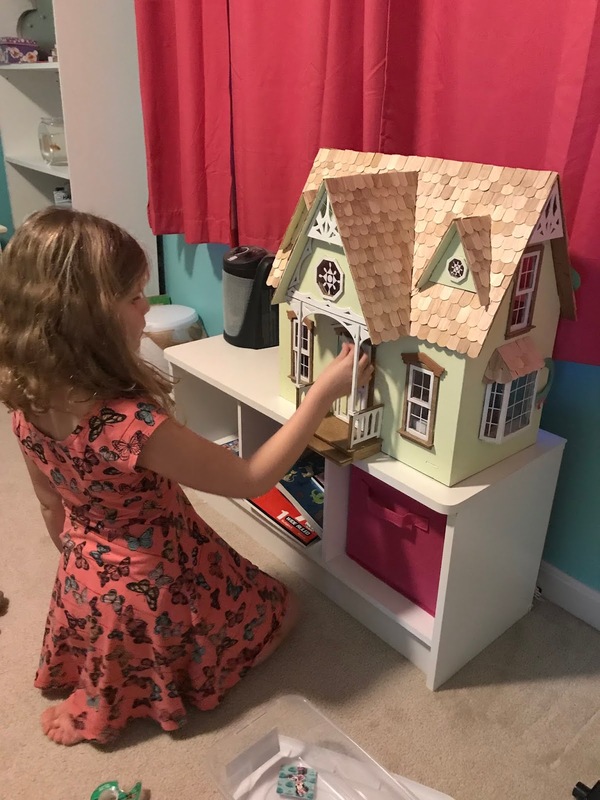 I started the first dollhouse in October. I put the last shingle on around 7:45 am Sunday morning…Two days before Christmas. Was it worth it? Appreciate Your Help With the Furniture. I’ve lived my life with the attitude that if I start something I should finish it. I’ve also learned along the way that life done together is always better. My oldest daughter and my mother joined me in making furniture for the dollhouses. What a fun evening. With each dab of glue and each challenge I faced, I thought of my three granddaughters sweet little faces. Their reaction to the finished project was more than I imagined. They didn’t see the imperfections. They weren’t concerned about which color they got. They didn’t wonder at why the furniture was made from everything from cardboard and wood to masking tape and soap boxes. What they saw was a dollhouse of their own. They didn’t rush to open more gifts. They each stood around the table carefully arranging the furniture in the rooms as they desired. My heart is full. I imagine my grandparents felt exactly this way as they delivered those seven dollhouses to seven grateful granddaughters so many years ago. Uh, make that a few of my favorite Christmas posts. I must have been caught up in The Sound of Music! I digress. As I was thinking about this post and my post for next week I looked back over the posts I’ve made these past seven years. Yes, in January, A Novel Creation will be SEVEN YEARS OLD! Three of my Christmastime posts stood out. All three were popular with readers and all three were favorites of mine. I decided to share these posts with you and to tell you why I chose them. The big take-away from the experience were simple truths I learned from my Uncle Noah that Christmas. I only recently connected them to the way we are instructed to live our lives in Romans 12. It was a good reminder that we not only learn from others, but others are learning from us. To read “Christmas” CLICK HERE. The second post I chose for this collection of favorites is called “The Candle.” I had a lot of readers for this one even though it is probably a bit melancholy. It is the story of the wedding candle Tom gave me as a gift. We were married exactly one week before Christmas. We burned that candle every anniversary. The last time I burned it was for his funeral. The candle that was supposed to last twenty-five years lasted for forty-three. And it could probably last another twenty or thirty years. If you’re in the mood for a good cry, I guess this one is for you. CLICK HERE to read “The Candle” first posted in December of 2015. Finally, I chose “The Christmas Gift” as the third and final post for this collection. This is a personal favorite. It is the story of spending Christmas in Kosovo away from my family. There is something there…something beneath the surface that I didn’t recognize until I reread this post a few days ago. It speaks to healing and strength. I know living in Europe so far from my family was in many ways challenging, but as I reread this post, I could see how much I grew during that time. I realized there is a big difference between being alone and being lonely. To read “The Christmas Gift,” CLICK HERE. Well, that’s it… My three gifts to you. Gifts to encourage you to live a life where you treat others with respect and love. Gifts to remind you that our time on earth is short and we need to hold those we love close each day. Gifts to give you pause to reflect on the greatest gift ever given to us by God…His Son. All Already Given…Yours to Receive. And once you’ve read and sighed and commented…take a deep breath and find peace in this season of your life. Merry Christmas! Hey I’ve been there. I was a young wife, mother of three, full-time teacher, and active in my church. I know the sound of the word “busy.” And the weeks before Christmas seem to be the worse. You have visions of sitting down and enjoying your child’s concert, but your mind is elsewhere. You would love to be able to buy a few gifts for that sweet child on the “Wish Tree” who wrote “All I want is a soccer ball and a coat, but you wonder when you’ll have the time and where you’ll get the money. 1. Recognize that Christmas comes on December 25 every year.Because you know it is coming, you can plan ahead. Sounds like a no brainer, right? Maybe, but I personally know people who act as if Christmas came as a total surprise. One family takes out a loan every December to buy extravagant gifts for their kids. They count on their income tax return to pay back the loan. Buying gifts throughout the year takes stress off of you at Christmastime and helps with your budget. 2. Decide on four or five constant list items for each child you buy for at Christmas.For my girls, I always gave them a book, something musical, something artistic, a game, and something collectible. With that “list” in mind, I could be on the lookout for those items throughout the year. Allison collected porcelain dolls, Danielle loved music globes, and Kendall collected Cherished Teddies. Since I knew what each collected, I watched for sales. If I met an author of children’s books, I would be able to not only give the girls each a book I could give them signed copies. Something musical could be anything from a harmonica for my oldest to a wind-up musical toy for the baby. You get the idea. With a list of constants in mind, I had at least four or five Christmas gifts for each child before school started in September. Yep, that's a picture of me with Patricia Polacco. I bought her books for my girls for Christmas. 3. Pick and choose from the “needs list.”The needs list usually included items of clothing. If someone needed a new winter coat and could wear their old one until Christmas, fine. I wouldn’t make them struggle through ice and snow for a month, though, just to have another gift under the tree. But my girls always neededsome sort of clothing. Because they were growing so fast, I bought clothing as close to Christmas as I could. And… because I already had several gifts to put under the tree by then, I had the money I needed to purchase that new sweater or outfit for each of them. 4. Pick and choose from the “wants list.”Kids see it they want it. It’s a given. My children were never greedy but they certainly went through spells of wanting what was trendy or cute even though I knew the trend wouldn’t last or the “cuteness’ wouldn’t continue to hold their interest. Let’s face it, we think that stuffed hippo is adorable, too, but we know that unless the child can’t get to sleep at night without it, it will wind up in the bottom of the toy box or set aside in the corner of the bedroom. That said, if you already have gifts for them you purchased throughout the year, you can cheerfully choose something from the “want list.” Just not everythingthey want. So why am I writing this now? So close to Christmas? I spoke with a woman at church this week who told me how much she did not like Christmas. She said it was stressful and she was exhausted. She almost didn’t come to the women’s event because she had so much shopping to do and she didn’t take a “wish tree” child this year because she couldn’t afford the time or money it took to shop for one more person. It may not help you much this year, but January is right around the corner. Time to start planning for next year. I’m serious. Let me know you're here...Leave a comment or your idea for a stress free holiday! I am a product of the space age. I was a bit too young to remember the launch of Sputnik by the Russians in 1957, but I remember when Alan Shepard went into space in May of 1961. I remember it because my birthday was only three days earlier. Everyone seemed obsessed with the notion of exploring outer space. I’ve shared with students through the years that we have computers today because of the need for them to operate rockets to conquer space. It’s true. Space travel inspired futuristic comic books and movies. The idea of living in outer space or on another planet captured the imagination of everyone. Including the Hanna-Barbera team that produced the popular cartoon, The Flintstones. A space age cartoon called the Jetsons arrived on the scene in 1962 only a year after Shepard’s historic flight. 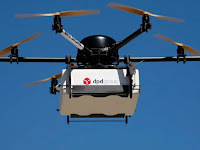 The Jetsons had cool gadgets –cars that could fly and a station in the kitchen where you merely punched in the food item you wanted and it appeared hot and ready in a minute. We don’t have cars that fly but we do have microwaves. Of course we have to put the food in it first. Although the story themes were traditional, I watched the Jetsons fascinated to see how people might live in the future. Consider this: The Jetsons had two children Judy and Elroy. The children climbed in a pod and were delivered to school every morning. Unimaginable? 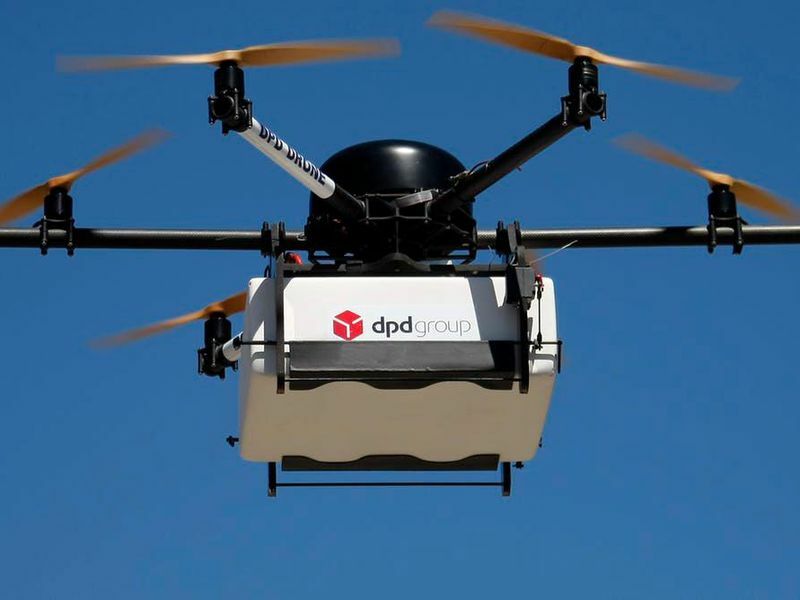 We have drones that will deliver packages. Not that far fetched after all. George Jetson, the father in the cartoon wore a watch that also served as a computer of sorts. His boss would call him and they could actually see each other as the talked. Silly? Not so much. It was, in essence a smart watch. Jane Jetson, the mom, could speak to friends via Facetime, though it wasn’t called that. She even had a special mask of her own face she could wear if the call was early and she hadn’t combed her hair. We have a lot of what was only imagined in the 1960’s. I’ve personally reaped the benefits of products invented because of the space race. I’m typing this post on my laptop computer. I have a cell phone I can take with me anywhere. My computer in my car can calculate the best route to drive to my desired destination. But those inventions pale in comparison to my newest acquisition. You see, the Jetsons had a robot named Rosie who cleaned the house for them. The day after Thanksgiving, a local department store offered a Roomba at a great price during the “Black Friday” sale. So I treated myself to an early Christmas present. A Roomba is an automated vacuum to sweep my floors while I sit here and type. A programmable robot. A Rosie of my own. The future has arrived. Well, almost. I’m still hoping they’ll invent a filter for the camera on my Smart phone that will make me look younger and thinner. What do you wish to see invented next? Think. Believe. Create. It all starts with your imagination.